Dermal fillers are a safe and instant treatment to reduce facial lines and wrinkles. These lines and creases typically begin to appear after the age of 25 and are caused by the natural breakdown of collagen and elastin fibres as we age. This natural breakdown is accelerated by factors such as smoking, sun exposure, stress and poor diet. Cosmetic fillers have grown to be one of the most popular anti-ageing/beauty treatments available today because they result in an instant and natural looking beauty lift with very little down-time (typically a day or so of mild redness and swelling). Most popular areas to treat are the nose-to-mouth lines (i.e. nasolabial folds), lips, around mouth, cheeks and between the eyebrows (i.e. glabella). Today’s wrinkle reduction treatments have come a long way from the first-generation collagen injections. Using products such as hyaluronic acid based fillers, there is virtually no risk of allergic reaction and the results are much longer lasting. Natural Looking: See our Before and After gallery and judge for yourself how natural the results are! Effective: Removing those deep-set lines and wrinkles truly takes years off you! There are a huge variety of fillers on the market today. At botonics, we usually use the most popular brands, but if there is something specific you’d prefer please let us know and we will probably be able to use it for you. Most fillers used today are Hyaluranic Acid derived because these are very safe with virtually no risk of allergic reaction. HA fillers typically last from 5 to 12 months, depending on the product used, where it is injected and your own metabolism. New fillers are launched all the time, and we are often involved in their clinical trials so if there’s something new you’d like to try, chances are we’ve got experience in using it. At your free consultation, the practitioner will review your detailed medical history and advise whether Dermal filler treatment is appropriate for you. Most people are keen to get their lines and wrinkles reduced as soon as possible. We are usually able to do the treatment on the same day as your consultation if you wish to proceed. A topical anaesthetic is applied, and we wait for it to take full effect (about 30 minutes). The Dermal filler gels is then injected into the skin under the lines and wrinkles. There is only a mild discomfort because of the anaesthetic, especially if we’re using one of fillers that include an additional anaesthetic within the product (e.g. Restylane Lido, Perlane Lido, Juvederm Ultra Sensitive). The injections only take about 10 – 20 minutes. The wrinkle filler generally lasts about 5 – 12 months with Hylauronic Acid fillers and about 18 – 24 months with Calcium Hydroxylapatite fillers. 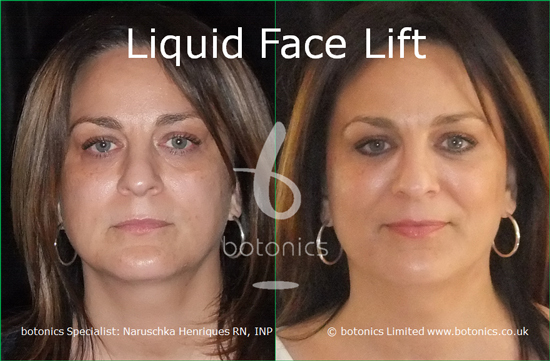 The filler is gradually broken down over time and safely eliminated through the body’s natural metabolic processes. To learn more, see our Dermal Filler Frequently Asked Questions. If you want to know what you’ll need to do after your treatment, see our Dermal Filler Aftercare Instructions. You may also be interested in Dermal fillers for men and Dermal filler before and after photos. Our cosmetic filler treatments are administered by qualified doctors and nurses who are experienced in the treatment of facial lines and wrinkles. Our price for Dermal filler treatments start from just £250, and you can spread the cost of any treatment over £600 interest free for up to three months. Who is a candidate for wrinkle filler treatment? If you’re unhappy with the lines and wrinkles you see in the mirror, want higher, more youthful looking cheeks or fuller lips, then our Dermal filler treatment could be your answer. Do you dream of not having deep-set lines, smaller cheek bones and thin lips? Dream of the time not long ago when your face was tight and line-free? Well, if you are ready to stop dreaming about a youthful face and start living in it, click on the Contact us link below to book a free consultation with our Dermal filler practitioner.